This is the remarkable true story of Ben Godwin who was struck by a car while riding a bicycle at age seven. The collision dislodged three inches of bone from his left leg. Doctors prescribed bone graft surgery and predicted a permanently crippled limb. Then God intervened-"the bone was restored by a creative miracle. Before and after x-rays prove this amazing act of God. This book also explores thought-provoking issues, such as, "How should we respond to tragedy?" "Why does God allow tragedy?" "Do miracles still happen today?" "How do you receive a miracle?" This is an excellent book to give someone who is dealing with tragedy or someone who is believing God for a miracle. 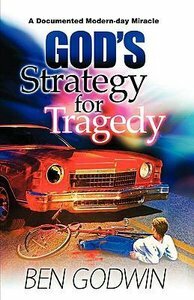 About "God's Strategy For Tragedy"